Tanira Kingi, Chairman of Whakaue Farming Ltd, talks about how optimising stocking rate and type on Ngongotaha sheep and beef station has reduced nutrient losses and helped increased profit. Ngongotaha Station is one of three Rotorua sheep and beef farms owned by Whakaue Farming Ltd, the largest landowner in the Lake Rotorua catchment.The farm has a total pastoral area of 363 hectares, with 232 hectares in forestry and native bush. 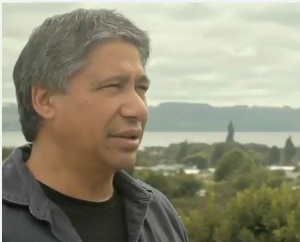 Tanira Kingi is Chairman of Whakaue Farming Ltd. Today Tanira talks about optimising stocking rates to improve profit while reducing nutrient losses. Kia ora and welcome to Ngongotaha Station. This is one of three farms owned by Ngati Whakaue Incorporation and managed by Whakaue Farming Ltd. Over the last few years we’ve been looking at alternative farming systems that would reduce our nitrate leaching and maintain or improve profitability. The Ngongotaha Stream flows past our farm and into the Lake Farm production needs to be considered alongside our environmental footprint. We’ve retired our steepest land and want to make the best use of the remaining pastoral land. We run a fairly conventional system here at Ngongotaha with sheep making up about around 60% of the total stock units. Previously our lambing rate was around 120% and additional lambs bought-in for finishing. Our cattle policy was a mix of short and long term trading cattle. In the past we needed about 20 hectares of winter and summer crop to help finish our lambs and cattle. We asked our farm consultant to review our farm system with a focus on improving profit and reducing leaching. This resulted in the system having 27% fewer stock, down to about 11 stock units per hectare. We kept roughly the same sheep to beef ratio, but the cattle policy now focuses on high value prime beef production. We’ve introduced Wagyu beef into the system and that looks like it’s going really well. We stopped cropping as it didn’t provide the returns to justify its costs. The lower stocking rate meant we could reduce our nitrogen fertiliser use and our labour and animal health costs also decreased. We now have lower total production but our profit margin per hectare is much better. This is mainly due to lower costs and higher productivity per animal. Lambing is now above 135% with heavier lambs. And we’ve also improved our lamb and beef marketing strategies. There are a few challenges with running a lower stocking rate system and also taking cropping out of the farm system as well. We have to utilise the pasture effectively and also retain the flexibility in the system. Sometimes that means making more silage, topping our pasture or accepting more tag on the hills. Although the system’s only been in place for the last couple of years, we’re very pleased with progress. The directors of Whakaue Farming Ltd have put some challenging profit targets in front of the management team along with our farm consultants and we’re making really good progress towards that, and more significantly we’ve managed to reduce our total nitrogen loss at the same time. An OVERSEER analysis indicates the new farm system reduced Nitrogen leaching by almost sixteen kilograms per hectare, or forty-eight percent. This was driven by the removal of cropping, as well as less N fertiliser and a lower stocking rate. Farm profitability increased by about one hundred and thirty dollars per hectare, as a result of reduced costs, improved stock performance and product marketing. Reduced nitrogen leaching by almost sixteen kilograms per hectare, or forty-eight percent. View the full nutrient and cost analysis here. A lower stocking rate can lead to greater pasture surpluses. This may require making more sileage and greater weed control.